When all the water receded from Tampa Bay, it sparked fears over what would happen when it came rushing back. But the odd phenomenon may have actually saved the city from worse Irma devastation. The emptying of Tampa Bay on Sunday proved to be more than just an occasional weather phenomenon. Rather, it was a potential saving grace for the city of Tampa. National Weather Service meteorologist Stephen Shiveley said if water from the bay had not receded, storm surge in the city would have been much higher. If you aren't caught up, here's what happened on Sunday: When Irma was still a healthy Category 3 and 4-force hurricane in South Florida, its outer winds blew from the northeast into Tampa Bay, pushing the water out to the Gulf of Mexico. 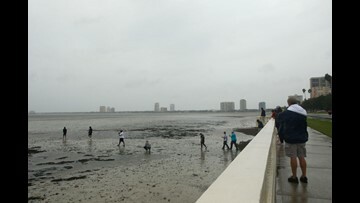 For a few hours, Tampa locals had the rare chance to walk, run and play on the bay's floor. One stretch of the bay was six feet below normal tide. At the time, forecasters worried what would happen once the storm passed Tampa. The winds from the northeast would shift to out of the southwest, potentially sending all that water, and then some, back into the bay. But Shiveley said the storm had weakened by the time it got to Tampa after making an early landfall near Naples. So when the winds did their turn about 2 or 3 a.m. Monday morning, they weren't strong enough to cause the storm surge forecasters had predicted. If the water hadn't pushed out, Shiveley said, storm surge could have been in the eight or nine-foot range. The highest it ever got in Tampa Bay was two feet. The bay was full of water again by 10 a.m. Monday. But Shiveley said the water never crested over the city's barriers. He said he doesn't know whether the water would have crested had the water not receded. However, he said, "We got super, super lucky."